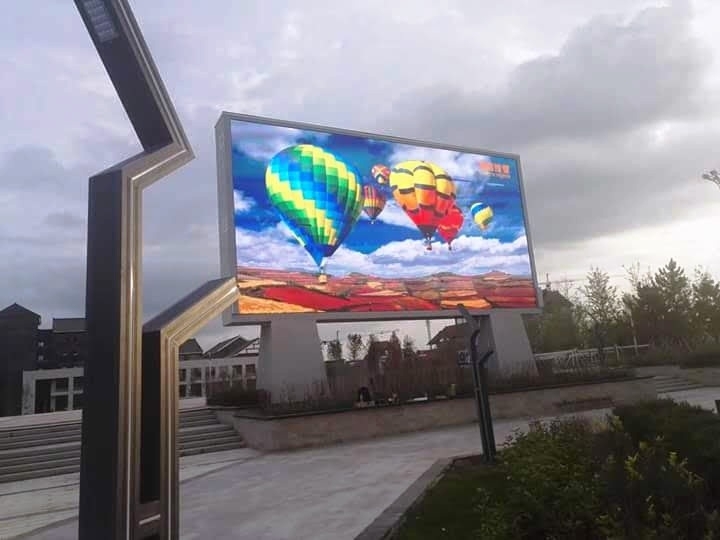 Outdoor full color LED screen as the darling of the outdoor media in new times, as to the rapid development of outdoor advertising, it is growing at a rate of more than 25% per year, with their true and vivid visual experience, high brightness, long life, make out full color LED display as an excellent carrier for outdoor advertising. However, from tens to hundreds of square meters, in order to expand the audience's vision and enhance the effectiveness of outdoor advertising, full color LED displays are usually installed in the open space of the top of the building. The so-called "Tall trees catch much wind", LED display with large area and high position is dazzling, but at the same time it must face the test of harsh environment such as wind and frost, thunder and lightning. To this end, a good outdoor high definition full color LED display, not only has high definition display, low energy consumption, controllable adjustment of viewing angle, IP67 protection level, etc. But also requires self-transparent, aesthetics that does not affect the appearance of the building design can be unique in the display of outdoor advertising media. So, in order to meet the requirements of outdoor LED screen, what elements should the outdoor full-color LED display have? Full color outdoor HD LED display as the main carrier of video advertising, requires a high definition display. This includes high resolution, high brightness, high contrast, etc. The high resolution ensures that the high-quality advertising image can be well rendered; the high brightness ensures that the image can be clearly displayed under direct sunlight; the high contrast is the powerful guarantee which LED display have even color of the picture, and exquisite image. Outdoor full color LED display must be called by the government, energy conservation and emission reduction must be implemented as an important standard in manufacturing, including product power consumption, scattering performance and steel structure required for LED display installation. The main task of outdoor high definition full color LED display is to advertise and promote the image. Therefore, let more audiences see the picture is the primary goal of outdoor high definition full color LED screen, adopting large viewing angle design and covering the largest range view angle. Usually, the outdoor LED screen area is large, and most of them are installed in places where people are denser. Therefore, we should pay special attention to the LED display protection level, especially the southeast coastal area where the typhoon is frequently login. The design should consider the solid foundation of the steel structure, wind load, waterproof, dust-proof, moisture-proof and many other factors, the protection level should be IP65 and above, extend the service life of the LED display and enhance the reliability. To ensure lightning protection, the LED main body and the outer casing should have good grounding measures, and the grounding form should be considered separately according to whether the LED display is independent or attached to the outer wall of the building. At the same time, the integration of electronic components in outdoor LED displays is high, and the sensitivity requirements for anti-interference are also increasing. In order to minimize electromagnetic interference, lightning protection devices should usually be installed on LED displays and buildings. When the outdoor LED display works, it will generate a certain amount of heat. If the ambient temperature is too high and the heat dissipation is poor, the LED chip and related integrated circuits may not work properly or even be burnt, so that the LED display system cannot work normally, so usually the outdoor LED display should be equipped with a cooling fan or air conditioner, especially for LED screens that need to work in high temperature subtropical and tropical regions for a long time.